Tree to Tree Adventure Park’s Great Getaway Package in Gaston, Oregon offers a fantastic, fun-filled adventure at the original zip line and aerial adventure park on the West Coast. Enjoy discounted pricing on an unforgettable outdoor adventure followed by wine tasting at one of our local winery partners. Each package includes our aerial obstacle course adventure, wine tasting for each person and a $20 winery gift card good at participating local wineries. 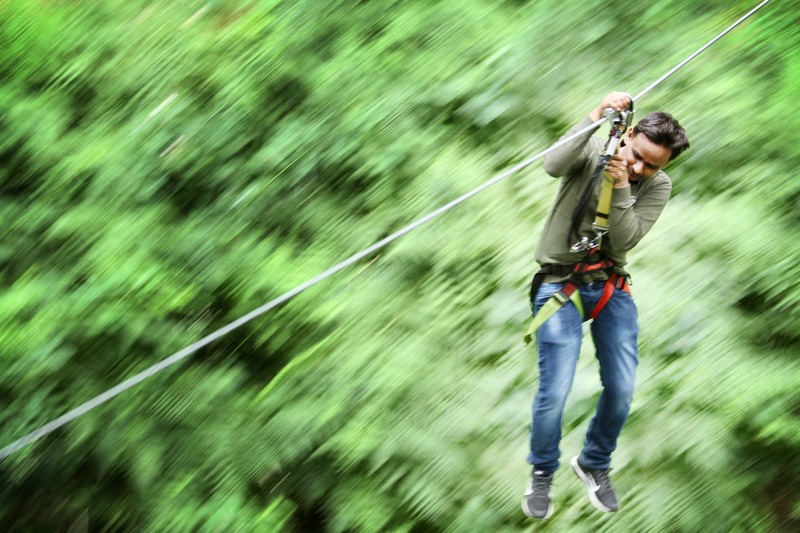 Plus, you can add our exhilarating zip line canopy tour for an additional fee. Call us to purchase a Great Getaway package today. Tasting Room 14135 NW Timmerman Rd. Some days, standing at a particular spot in the vineyard where the light spills across the slope of Blooming Hill, it is possible to believe the world has just begun and life is full of promise. The soft sound of a breeze rustling the vines, the warm touch of sun on emerging fruit, sky as far off as anyone can see beyond the hills reminds us that there may be nothing quite so wonderful as the simple pleasures given us by nature. At A Blooming Hill Vineyard, we revel in the gift of working the land every day and that we are rewarded with its simple and elegant bounty. This is our gift to you in every bottle of A Blooming Hill Vineyard wines. Oregon's Willamette Valley is one of the few places in the world suited to growing world-class Pinot Noir. We consider it a privilege to have been part of Oregon wine industry since 1983 when we purchased our farm. Since then, it has been our mission to produce exceptional estate-driven wines from our sustainably farmed 20-acre vineyard. Montinore Estate is a Demeter-certified Biodynamic 230-acre estate at the northern end of the Willamette Valley appellation. As a family-run winery, we strive to create the best wines we can while providing a healthy environment for all of us who work here, our families and our local community. Just about half of our estate is planted to Pinot Noir while the rest is planted to several cool climate white varieties including Pinot Gris, Gewürztraminer, Riesling and Müller-Thurgau. A perfect picnic setting, grab your family and friends and come enjoy …Cheers! Plum Hill Vineyards is a small, family owned winery built on a historical dairy farm in a pastoral setting, nestled between the cities of Forest Grove and Gaston, Oregon. We feature quality hand crafted wines in limited quantities. Currently we grow and/or have available for tasting Pinot Noir, Pinot Blanc, Pinot Gris, Chardonnay, Rose', Riesling, Müller-Thurgau, and Schönburger. Oak Knoll Winery is a Pioneer of the Oregon Wine Industry. Starting in 1970 making fruit wines and then moving into producing Pinot Noir, Pinot Gris and a myriad of other wines. Oak Knoll Winery has a wine for every palate and budget. We offer a wide variety of dry white and red wines as well as a sweet wine collection. Our Winemaker has been making our wine for 35 years and loves to make wines that our guests love. We do special events every month of the year and encourage you to come get involved. Oak Knoll is non pretentious and love to provide our guests with a wonderful experience of truly enjoying the wine we offer, sharing knowledge and friendship. We are open May 1 - Sept 30 from 11am - 6pm and Oct 1 - Apr 30 from 11am - 5pm. Come hang out with us and experience a new experience in wine tasting.